Spamilton stars Aaron Michael Ray & Tristan J. Shuler bring major laughs in the hit Gerard Alessandrini Hamilton parody that pokes fun at the Tony-winning mega-blockbuster, as well as other notable musicals and creators from the current Broadway landscape. The dynamic duo took over the BroadwayBox Instagram on Saturday, September 30 to bring followers along for a two-show day off-Broadway. Check out their Insta story in the video below, and see them live in Spamilton. What a fun day! Thanks so much once again for hanging out with us at @spamiltonlive! Come on thru and laugh with us 8 times a week at the Puerto Rican Traveling Theater! This is @aaronraystagram and @tristanjshuler signing off! 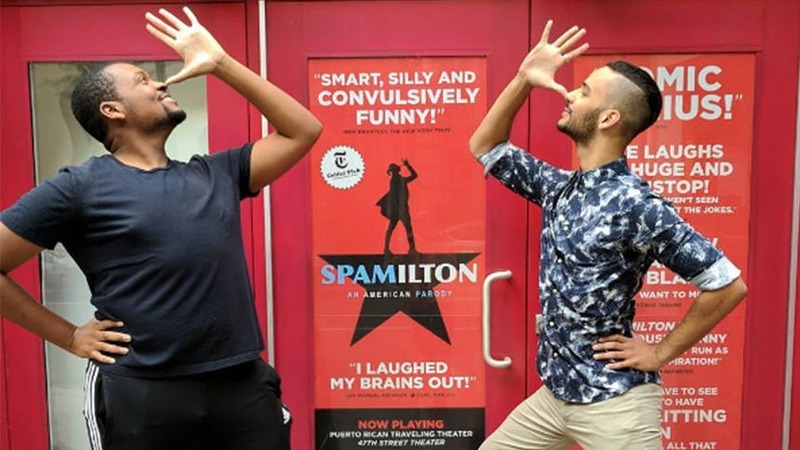 Don't miss your chance to see Aaron Michael Ray & Tristan J. Shuler in Spamilton at off-Broadway's Puerto Rican Traveling Theatre.